There was a time, not too long ago, when we were all closely connected to the food we ate. If we didn’t farm it ourselves, we most likely knew the people who did. At that time, the foods we ate were natural, unadulterated, and local. Then along came big farming corporations. They applied the lessons from the Industrial Revolution to our farming practices. Suddenly, instead of delivering food from farms to local markets, these corporations started sending it to factories instead. And guess what happens at factories. That’s right, products are made. Now what starts as wholesome food is being manipulated, processed, enhanced, and preserved so it no longer resembles what it once was. Food is now a product, with fancy packaging, additives, and all. Food corporations are watching their profits grow – right along with our waistlines. While the industrialization of farming has made food more abundant, it has also made it less nutritious. High-calorie, low-nutrition foods are inexpensive and popular. Because of this, we are now seeing an epidemic of people who are both overfed and undernourished at the same time. Diet-related diseases like diabetes and heart disease are on the rise. We’re becoming a nation that is so disconnected from natural, local foods that kids can’t even tell you where eggs or milk come from. 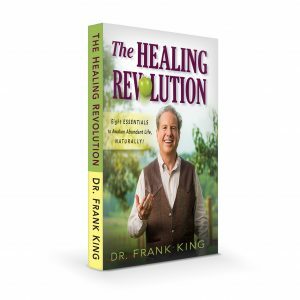 The Healing Revolution® takes us back to the days of knowing where our food comes from. Let’s return to eating to live, and not living to eat. When we nourish ourselves with wholesome, whole foods, we put ourselves on a path to healthier lives with cleaner eating. Go back to the basics. Eat whole, real foods – fresh, unprocessed, and organic whenever possible. Plant a garden. Nothing connects you to your food better than growing it yourself. And nothing tastes better than a tomato plucked straight from the vine or a carrot dug from the ground with your own hands. Chew more. Studies show that people who chew each bite 40 times eat smaller portions than those who chew 15 times. Plus, taking longer to chew and savor your food allows you to enjoy it more. Eat the rainbow. And no, Fruity Pebbles don’t count. Eat fresh foods that are full of a variety of colors. The more varied your diet, the more vitamins, nutrients, and minerals you’re getting. Think of food as medicine. Real, nutrient-dense food gives you more energy, better brainpower, and stronger immunity. Shop the perimeter of the grocery store. Most of the processed foods are on the interior shelves. Good food choices are essential to a vibrant life. What simple changes can you make today to nourish body and soul with nutrition?